More than 43% of law enforcement officers personally know an active or retired police officer that has taken their own life. 78% of law enforcement officers know a department or agency that has lost one of its officers to suicide. The rate of suicide among first responders is 50% higher than the general population. The strains, stresses and trauma of a police officer’s job directly impacts their mental health. The stigma of weakness associated with an officer’s inability to cope with these stresses are causing many officers to deal with them in a fateful way. This stigma also prevents many departments from recognizing this problem and allocating the necessary resources to help their officers deal with their stresses proactively and positively. Call For Backup is a campaign launched by Humanizing the Badge to address this stigma, and bring awareness to a unique suicide prevention program for first responders. The Call For Backup suicide awareness and prevention program educates officers on how to help each other, as well as themselves deal with the stresses they face in their line of work. It also helps first responders understand how their job naturally creates stress, both mentally and physically. This unique training program teaches them how to be more resilient against stress when a major event occurs. Most importantly, the program helps first responders become vigilant at watching out for one another and provide backup when a colleague needs it, and call for backup whenever necessary. The Homes for Heroes Foundation is proud to support Humanizing the Badge’s Call For Backup campaign to help reduce the suicide rate among our first responders. 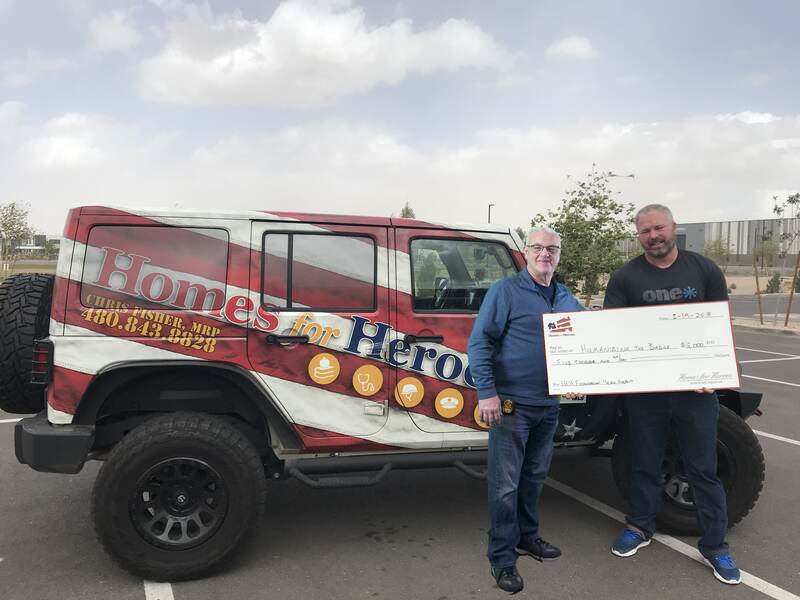 Homes for Heroes Affiliate Specialist, Chris Fisher, presented the Call For Backup campaign with a $5,000 grant on behalf of the Homes for Heroes Foundation. As a board member of Humanizing the Badge, Chris Fisher knows first-hand how important the work that Humanizing the Badge is doing through this unique campaign. Police departments can access the necessary resources to help their officers with suicide awareness and prevention through the Call for Backup campaign. Simply send a message to Humanizing the Badge to bring the Call for Backup program to your department.